In the eighteenth and nineteenth centuries people dreaded losing their teeth The toothless had sunken cheeks and looked old before their time. Replacement teeth were traditionally made from ivory (hippopotamus, walrus, or elephant) which deteriorated quicker than real teeth. More costly dentures were made with an ivory base and then set with real human teeth. The biggest purveyors of teeth were the resurrectionists who stole corpses to sell to medical schools. A set of teeth was one of the perks of the job. Even if they dug up a body too far gone for the anatomy lesson, they could still sell the teeth. Unfortunately for some unlucky recipients, syphilis and tuberculosis were unknowingly transmitted into their mouths from infected donors. 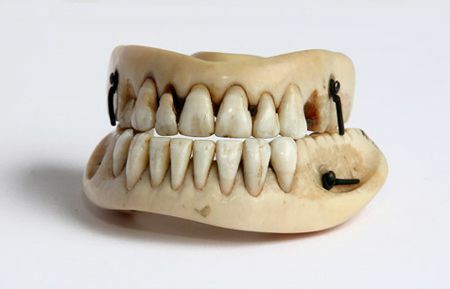 Apparently, Waterloo teeth still appeared in dental supply catalogues of the 1860s. How interesting, thanks for sharing. Okay I can't believe I'm going to admit this, but I got dentures when I was only 35. I am a recovering heroin addict, and I lost all my teeth when I had been going to a methadone clinic for a while. It makes your teeth decay really bad. This is very interesting, though. I never knew they made dentures that long ago, and the materials that were used to make them... Shocking! Looks like they must drill a hole through your jaw and then you use those pins to hold them in. Pretty neat, I had never heard of this, thanks for the info. Anyone else singing ABBA's 'Waterloo' in their head after reading the title?